Jimmy Rollins and Raul Ibanez are now atop the NL voting leaderboard. Still whining about it being only this year's best players should be selected with Rollins pretty much sucking it up this year? He's batting 0.222 with just 3 HR and 10 SB. The third 2009 National League balloting update for Major League Baseball's All-Star Game, to be held July 14 in St. Louis, was released Monday and two more Phillies -- shortstop Jimmy Rollins and outfielder Raul Ibanez -- have taken the lead at their respective positions. Dodgers outfielder Manny Ramirez, suspended for 50 games on May 7 for violating baseball's drug policy, remains a topic of conversation. The slugger remained in the fifth spot but with an edge of fewer than 6,000 votes over the Phillies' Shane Victorino. 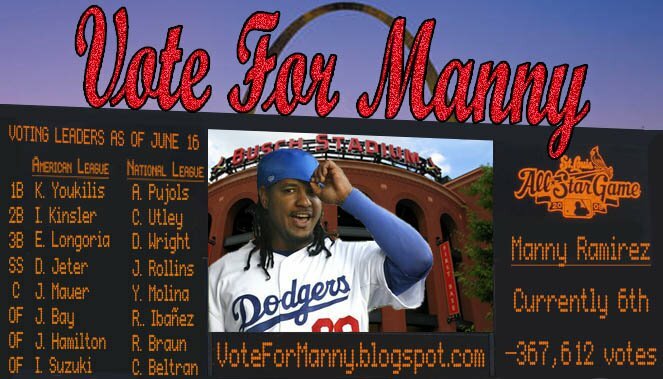 Two weeks ago, Ramirez was in the fourth spot among outfielders on the ballot. LOL @ Philly fans always ripping on the Steroid users in the first place. The 1993 Phillies say "Hi." He's batting 0.222 with just 3 HR and 10 SB.